Orthopedic surgery or orthopedics, also spelled orthopaedics, is the branch of surgery concerned with conditions involving the musculoskeletal system. Orthopedic surgeons use both surgical and nonsurgical means to treat musculoskeletal trauma, spine diseases, sports injuries, degenerative diseases, infections, tumors, and congenital disorders. 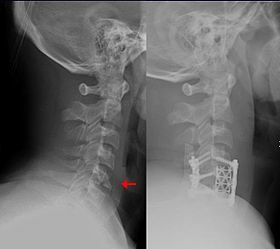 This fracture of the lower cervical vertebrae is one of the conditions treated by orthopedic surgeons and neurosurgeons. Nicholas Andry coined the word in French as orthopédie, derived from the Ancient Greek words ὀρθός orthos ("correct", "straight") and παιδίον paidion ("child"), and published Orthopedie (translated as Orthopædia: Or the Art of Correcting and Preventing Deformities in Children) in 1741. The word was assimilated into English as orthopædics; the ligature æ was common in that era for ae in Greek- and Latin-based words. Though, as the name implies, the discipline was initially developed with attention to children, the correction of spinal and bone deformities in all stages of life eventually became the cornerstone of orthopedic practice. As with many words derived with the "æ" ligature, simplification to either "ae" or just "e" is common, especially in North America. In the US, the majority of college, university and residency programs, and even the American Academy of Orthopaedic Surgeons, still use the spelling with the digraph ae, though hospitals usually use the shortened form. Elsewhere, usage is not uniform: in Canada, both spellings are acceptable; orthopaedics usually prevails in the rest of the British Commonwealth, especially in the UK. Many developments in orthopedic surgery have resulted from experiences during wartime. On the battlefields of the Middle Ages the injured were treated with bandages soaked in horses' blood which dried to form a stiff, but unsanitary, splint. Originally, the term orthopedics meant the correcting of musculoskeletal deformities in children. Nicolas Andry, a professor of medicine at the University of Paris coined the term in the first textbook written on the subject in 1741. He advocated the use of exercise, manipulation and splinting to treat deformities in children. His book was directed towards parents, and while some topics would be familiar to orthopedists today, it also included 'excessive sweating of the palms' and freckles. Jean-André Venel established the first orthopedic institute in 1780, which was the first hospital dedicated to the treatment of children's skeletal deformities. He developed the club-foot shoe for children born with foot deformities and various methods to treat curvature of the spine. Advances made in surgical technique during the 18th century, such as John Hunter's research on tendon healing and Percival Pott's work on spinal deformity steadily increased the range of new methods available for effective treatment. Antonius Mathijsen, a Dutch military surgeon, invented the plaster of Paris cast in 1851. However, up until the 1890s, orthopedics was still a study limited to the correction of deformity in children. One of the first surgical procedures developed was percutaneous tenotomy. This involved cutting a tendon, originally the Achilles tendon, to help treat deformities alongside bracing and exercises. In the late 1800s and first decades of the 1900s, there was significant controversy about whether orthopedics should include surgical procedures at all. Examples of people who aided the development of modern orthopedic surgery were Hugh Owen Thomas, a surgeon from Wales, and his nephew, Robert Jones. Thomas became interested in orthopedics and bone-setting at a young age and, after establishing his own practice, went on to expand the field into general treatment of fracture and other musculoskeletal problems. He advocated enforced rest as the best remedy for fractures and tuberculosis and created the so-called 'Thomas Splint', to stabilize a fractured femur and prevent infection. He is also responsible for numerous other medical innovations that all carry his name: 'Thomas's collar' to treat tuberculosis of the cervical spine, 'Thomas's manoeuvre', an orthopedic investigation for fracture of the hip joint, Thomas test, a method of detecting hip deformity by having the patient lying flat in bed, 'Thomas's wrench' for reducing fractures, as well as an osteoclast to break and reset bones. Thomas's work was not fully appreciated in his own lifetime. It was only during the First World War that his techniques came to be used for injured soldiers on the battlefield. His nephew, Sir Robert Jones, had already made great advances in orthopedics in his position as Surgeon-Superintendent for the construction of the Manchester Ship Canal in 1888. He was responsible for the injured among the 20,000 workers, and he organized the first comprehensive accident service in the world, dividing the 36 mile site into 3 sections, and establishing a hospital and a string of first aid posts in each section. He had the medical personnel trained in fracture management. He personally managed 3,000 cases and performed 300 operations in his own hospital. This position enabled him to learn new techniques and improve the standard of fracture management. Physicians from around the world came to Jones’ clinic to learn his techniques. Along with Alfred Tubby, Jones founded the British Orthopaedic Society in 1894. During the First World War, Jones served as a Territorial Army surgeon. He observed that treatment of fractures both at the front and in hospitals at home was inadequate, and his efforts led to the introduction of military orthopedic hospitals. He was appointed Inspector of Military Orthopaedics, with responsibility over 30,000 beds. The hospital in Ducane Road, Hammersmith became the model for both British and American military orthopedic hospitals. His advocacy of the use of Thomas splint for the initial treatment of femoral fractures reduced mortality of compound fractures of the femur from 87% to less than 8% in the period from 1916 to 1918. The use of intramedullary rods to treat fractures of the femur and tibia was pioneered by Gerhard Küntscher of Germany. This made a noticeable difference to the speed of recovery of injured German soldiers during World War II and led to more widespread adoption of intramedullary fixation of fractures in the rest of the world. However, traction was the standard method of treating thigh bone fractures until the late 1970s when the Harborview Medical Center in Seattle group popularized intramedullary fixation without opening up the fracture. The modern total hip replacement was pioneered by Sir John Charnley, expert in tribology at Wrightington Hospital, England in the 1960s. He found that joint surfaces could be replaced by implants cemented to the bone. His design consisted of a stainless steel one-piece femoral stem and head and a polyethylene, acetabular component, both of which were fixed to the bone using PMMA (acrylic) bone cement. For over two decades, the Charnley Low Friction Arthroplasty and its derivative designs were the most-used systems in the world. This formed the basis for all modern hip implants. The Exeter hip replacement system (with a slightly different stem geometry) was developed at the same time. Since Charnley, there have been continuous improvements in the design and technique of joint replacement (arthroplasty) with many contributors, including W. H. Harris, the son of R. I. Harris, whose team at Harvard pioneered uncemented arthroplasty techniques with the bone bonding directly to the implant. Knee replacements using similar technology were started by McIntosh in rheumatoid arthritis patients and later by Gunston and Marmor for osteoarthritis in the 1970s developed by Dr. John Insall in New York utilizing a fixed bearing system, and by Dr. Frederick Buechel and Dr. Michael Pappas utilizing a mobile bearing system. External fixation of fractures was refined by American surgeons during the Vietnam War but a major contribution was made by Gavril Abramovich Ilizarov in the USSR. He was sent, without much orthopedic training, to look after injured Russian soldiers in Siberia in the 1950s. With no equipment he was confronted with crippling conditions of unhealed, infected, and malaligned fractures. With the help of the local bicycle shop he devised ring external fixators tensioned like the spokes of a bicycle. With this equipment he achieved healing, realignment and lengthening to a degree unheard of elsewhere. His Ilizarov apparatus is still used today as one of the distraction osteogenesis methods. Modern orthopedic surgery and musculoskeletal research has sought to make surgery less invasive and to make implanted components better and more durable. In the United States, orthopedic surgeons have typically completed four years of undergraduate education and four years of medical school. Subsequently, these medical school graduates undergo residency training in orthopedic surgery. The five-year residency is a categorical orthopedic surgery training. Selection for residency training in orthopedic surgery is very competitive. Approximately 700 physicians complete orthopedic residency training per year in the United States. About 10 percent of current orthopedic surgery residents are women; about 20 percent are members of minority groups. There are approximately 20,400 actively practicing orthopedic surgeons and residents in the United States. According to the latest Occupational Outlook Handbook (2011–2012) published by the United States Department of Labor, between 3–4% of all practicing physicians are orthopedic surgeons. These specialty areas of medicine are not exclusive to orthopedic surgery. For example, hand surgery is practiced by some plastic surgeons and spine surgery is practiced by most neurosurgeons. Additionally, foot and ankle surgery is practiced by board-certified Doctors of Podiatric Medicine (D.P.M.) in the United States. Some family practice physicians practice sports medicine; however, their scope of practice is non-operative. After completion of specialty residency/registrar training, an orthopedic surgeon is then eligible for board certification by the American Board of Medical Specialties or the American Osteopathic Association Bureau of Osteopathic Specialists. Certification by the American Board of Orthopaedic Surgery or the American Osteopathic Board of Orthopedic Surgery means that the orthopedic surgeon has met the specified educational, evaluation, and examination requirements of the Board. The process requires successful completion of a standardized written exam followed by an oral exam focused on the surgeon's clinical and surgical performance over a 6-month period. In Canada, the certifying organization is the Royal College of Physicians and Surgeons of Canada; in Australia and New Zealand it is the Royal Australasian College of Surgeons. In the United States, specialists in hand surgery and orthopedic sports medicine may obtain a Certificate of Added Qualifications (CAQ) in addition to their board primary certification by successfully completing a separate standardized examination. There is no additional certification process for the other sub-specialties. The use of arthroscopic techniques has been particularly important for injured patients. Arthroscopy was pioneered in the early 1950s by Dr. Masaki Watanabe of Japan to perform minimally invasive cartilage surgery and reconstructions of torn ligaments. Arthroscopy allows patients to recover from the surgery in a matter of days, rather than the weeks to months required by conventional, 'open' surgery. It is a very popular technique. Knee arthroscopy is one of the most common operations performed by orthopedic surgeons today and is often combined with meniscectomy or chondroplasty. The majority of upper extremity outpatient orthopedic procedures are now performed arthroscopically. Arthroplasty is an orthopedic surgery where the articular surface of a musculoskeletal joint is replaced, remodeled, or realigned by osteotomy or some other procedure. It is an elective procedure that is done to relieve pain and restore function to the joint after damage by arthritis (rheumasurgery) or some other type of trauma. As well as the standard total knee replacement surgery, the uni-compartmental knee replacement, in which only one weight-bearing surface of an arthritic knee is replaced, is a popular alternative. Joint replacements are available for other joints on a variable basis, most notably the hip, shoulder, elbow, wrist, ankle, spine, and finger joints. In recent years, surface replacement of joints, in particular the hip joint, have become more popular amongst younger and more active patients. This type of operation delays the need for the more traditional and less bone-conserving total hip replacement, but carries significant risks of early failure from fracture and bone death. One of the main problems with joint replacements is wear of the bearing surfaces of components. This can lead to damage to surrounding bone and contribute to eventual failure of the implant. Use of alternative bearing surfaces has increased in recent years, particularly in younger patients, in an attempt to improve the wear characteristics of joint replacement components. These include ceramics and all-metal implants (as opposed to the original metal-on-plastic). The plastic chosen is usually ultra high-molecular-weight polyethylene, which can also be altered in ways that may improve wear characteristics. Between 2001 and 2016, the prevalence of musculoskeletal procedures drastically increased in the U.S, from 17.9% to 24.2% of all operating room procedures performed during hospital stays. In a study of hospitalizations in the United States in 2012, spine and joint procedures were common among all age groups except infants. Spinal fusion was one of the five most common OR procedures performed in every age group except infants younger than 1 year and adults 85 years and older. Laminectomy was common among adults aged 18–84 years. Knee arthroplasty and hip replacement were in the top five OR procedures for adults aged 45 years and older. ^ Bois-Regard, Nicolas Andry de; Library, Classics of Medicine (2 November 1980). "Orthopædia, or, The art of correcting and preventing deformities in children". Classics of Medicine Library – via Google Books. ^ "From Bonesetters to Orthopaedic Surgeons: A History of the Specialty of Orthopaedics" (PDF). Retrieved 2013-12-14. ^ Irving M (September 1981). "Care of emergencies in the United Kingdom". Br Med J (Clin Res Ed). 283 (6295): 847–9. doi:10.1136/bmj.283.6295.847. PMC 1507078. PMID 6794724. ^ Arthur Rocyn Jones. "JONES, Sir ROBERT, Bart". Welsh Biography Online. Retrieved 2010-12-31. ^ Wroblewski, B.M. (2002). "Professor Sir John Charnley (1911–1982)". Rheumatology. The British Society for Rheumatology via Oxford Journals. 41 (7): 824–825. doi:10.1093/rheumatology/41.7.824. PMID 12096235. Retrieved 2008-04-28. ^ Hamelynck, K.J. (2006). "The history of mobile-bearing total knee replacement systems". Orthopedics. 29 (9 Suppl): S7–12. PMID 17002140. ^ "Orthopaedics - Orthopaedic Surgeons - OrthoInfo - AAOS". ^ "American Board of Orthopaedic Surgery". ^ "AOBOS 2012 Candidate Handbook" (PDF). American Osteopathic Board of Orthopedic Surgery. 2012. Retrieved 19 September 2012. ^ Garret Jr., William E; et al. (2006). "American Board of Orthopaedic Surgery Practice of the Orthopaedic Surgeon: Part-II, Certification Examination Case Mix" (PDF). The Journal of Bone and Joint Surgery. Needham, MA. 88: 660–667. doi:10.2106/JBJS.E.01208. Retrieved November 30, 2016. ^ "Rotator Cuff Surgery is Most Common Upper Extremity Ambulatory Orthopaedic Procedure - OrthoConsult". 28 January 2017. ^ "Restoring Joint Function with Arthroplasty". www.hopkinsmedicine.org. Retrieved 2017-10-21. ^ "More youngsters going for knee replacement". The Hindu. Special Correspondent. 2015-02-27. ISSN 0971-751X. Retrieved 2017-10-21. ^ "Knee and Hip Replacement Wear Particles Side Effects: More Data". Regenexx®. 2011-03-13. Retrieved 2017-10-21. ^ Weiss AJ; Elixhauser A. (March 2014). "Trends in Operating Room Procedures in U.S. Hospitals, 2001—2011". HCUP Statistical Brief #171. Rockville, MD: Agency for Healthcare Research and Quality.